The film is a re-enactment of Sturt's second Australian expedition, which in 1829-30 traced the Murrumbidgee River to its junction with the Murray River and then followed the Murray to Lake Alexandrina. It was the first exploration to penetrate the center of the continent. "The Sturt Expedition" was one of the first features of Australia's Jubilee celebrations in 1951, when festivities were held throughout Australia to celebrate 50 years since the commonwealth was founded in1901. In addition to Rod, the crew was made up of fellow actor Grant Taylor, who portrayed Sturt, and six army officers. The modern crew took no shortcuts during filming in 1950, and there was no motor on the boat. "We did indeed row over a thousand miles down the Murrumbigee and Murray rivers and sailed across Lake Alexandrina," Taylor said. 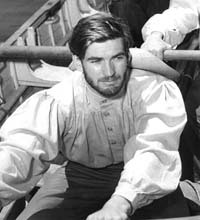 The six young Army officers and two actors, Grant and Rodney Taylor, who comprise the crew are in splendid physical condition, and hard rowing does not seem to tire them.